Exfoliating is basic skin care 101 and using an exfoliator – or exfoliant – is essential for healthy skin; though sometimes even the most sophisticated skin care connoisseurs forget this step, especially if they must pull out an extra scrub a couple times a week. Exfoliation or the process of removing dead skin cells is simple but transformative to the look and feel of your face, with a laundry list of benefits. 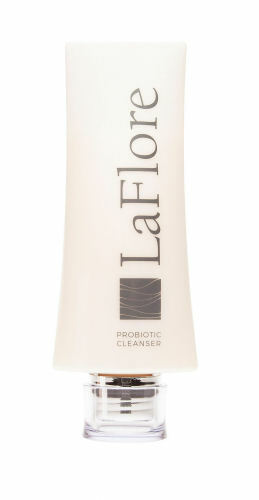 Using an exfoliator unclogs pores, which can help keep acne at bay. Among the benefits, exfoliating increases circulation while improving the appearance of fine lines and dark spots. The simple act of exfoliating not only gives a healthy glow on its own, but helps other products like serums, masks and moisturizers penetrate through skin better, since the dead stuff has been sloughed off. There are a couple different types of exfoliators to know about – chemical and physical. Chemical exfoliants (usually a better choice for oily/acneic skin) don’t require you to ‘scrub’ because they utilize acids or enzymes, whereas mechanical exfoliants include granules, sometimes in the form of jojoba beads or plant seeds. The many benefits of exfoliation should be enough (we know, we know…), but as the weeks fly by in a blur, are you exfoliating as often as you should? We’ve rounded up eight great exfoliators that can be easily added to your daily routine. So if you’ve been lazy, rejoice, we got your covered! Be sure to read each product label before use; some products may increase skin’s sensitivity to the sun due to the nature of the ingredients. 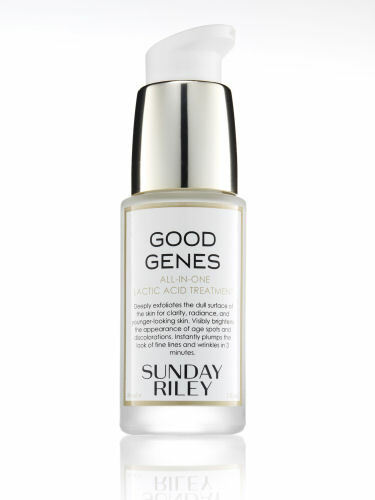 A holy-grail serum for many, Good Genes All-in-One Lactic Acid Treatment by Sunday Riley can be used under moisturizer, day or night. Star ingredient, lactic acid is a gentle AHA that works to exfoliate and hydrate. Licorice root and lemongrass add extra brightening, giving users a healthy glow. The moisturizer is lightweight and treats several concerns like dull skin, fine lines and wrinkles, dark spots and clogged pores. Good Genes can be used on any skin type or any age and can be easily added to your skin care lineup. Finally, you can credit ‘good genes’ to your beautiful skin. An enzymatic facial wash featuring pineapple extract, LaFlore Priobiotic Cleanser exfoliates the skin daily, while removing makeup and pollutants. As the name suggests, the cleanser also contains probiotic ingredients believed to not only boost hydration levels but resets the skin’s microbiome. You can also leave this cleanser on for 90 seconds as a ‘mini-mask,’ the Japanese mint will leave skin feeling cool and fresh. 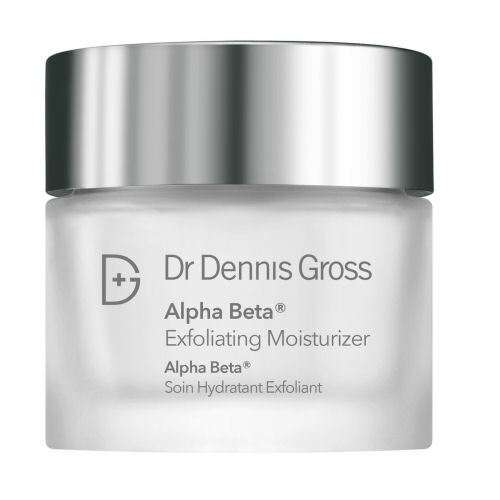 If you’ve been on the fence about trying a chemical peel, Dr. Dennis Gross Alpha Beta Exfoliating Moisturizer might be the perfect introduction. It’s a silky-smooth hydrating moisturizer that contains 7 different types of natural acids that work to exfoliate dead skin cells and decongest pores. It can be used day and night and contains the hydrating ingredients squalene, ceramides and Chinese foxglove for a dual-action exfoliating/moisturizing effect. 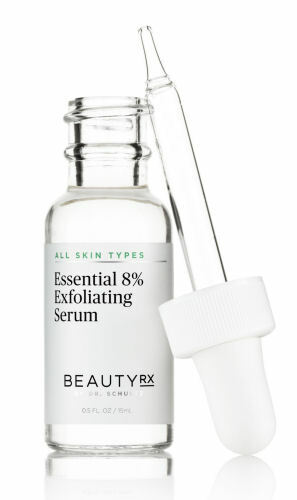 Developed by Dr. Neal Schultz and his feedback after seeing thousands of patients in his Park Avenue Dermatology practice, BeautyRX Serum Essential 8% Exfoilating Serum was born. As a proponent of daily exfoliating, Dr. Schultz developed the serum with an 8% glycolic acid in hopes of helping clients remove dull, dead skin. In addition to glycolic acid, the serum features Tetrafoliant®, a proprietary complex of exfoliating acids including salicylic, lactic and phytic. Willowherb and Japanese green tea leaf extract included in the formulation serve as antioxidants. For improved texture and tone, apply a few drops as your nightly serum for easy exfoliation. Nothing refreshes the skin quite line a toner and SkinMedica Rejuvenate Toner lives up to the notion. SkinMedica is a favorite brand among medical spas and was co-founded by dermatologist Dr. Richard Fitzpatrick. Experience a gentle exfoliation twice daily, after cleansing, by saturating a cotton round with toner and swiping across the face and neck. The process also helps remove your last traces of makeup. Natural alpha hydroxy acids including lactic, malic and glycolic combine with witch hazel, Vitamin A and green tea to not only rid dead skin but boost it with antioxidant protection. This cleansing face wash from Dr. Howard Murad’s skin care brand features both physical and chemical exfoliants to polish the skin, while washing away dirt, sweat and makeup. Murad AHA/BHA Exfoliating Cleanser features a trio of acids – salicylic, lactic and glycolic in addition to jojoba beads and sodium PCA, for added moisture. Part of the brand’s Age Reform collection, it is designed to be used 2-3 times weekly to restore skin’s resilience. Keep it in your shower to sneak in exfoliation and smooth the complexion on a regular basis. Wouldn’t you like to wake up to smooth skin each morning? 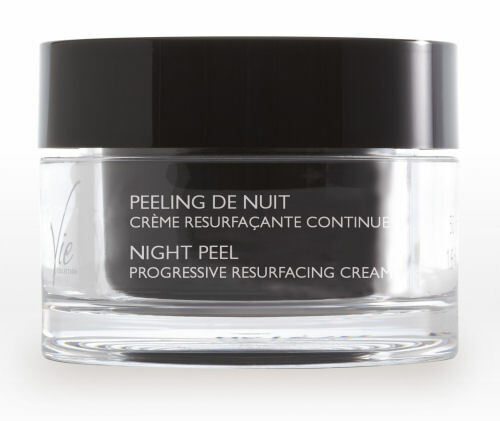 Thankfully, with Vie Collection’s Night Peel Progressive Resurfacing Cream you can. This luxe nighttime cream is formulated with two types of glycolic acid for both instant and continual exfoliation, and a glucosamine-based complex to stimulate cell renewal and the synthesis of collagen and hyaluronic acid. Rich in textured and scented in sweet florals, the cream is designed to be used as a specialized, intensive treatment and shouldn’t be combined with aggressive facial treatments. You want your lips to be soft, plump and oh-so-kissable right? Then don’t neglect exfoliating them, though they require different products than what you’d use on your face. Sara Happ to the rescue! She’s the absolute go-to gal when your lips need exfoliation and hydration. 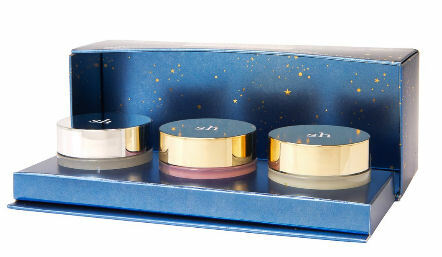 Her Sweet Dreams Lip Kit is a dreamy mix of 3 products that’ll give you the most luscious lips ever! Step 1 massage the Lip Scrub made with chamomile and lavender onto lips. Step 2 slather on some Sweet Clay Lip Mask for 2 minutes (or more), and wash off. Step 3, apply the Dream Slip before drifting off into dreamland. Wake up with soft, plump dewy lips. Products sold separately as well.